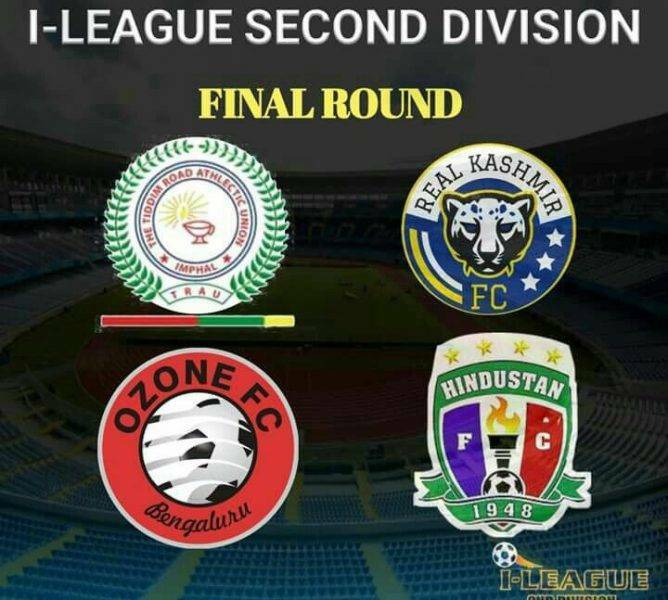 Real Kashmir FC, TRAU FC, Ozone FC and Hindustan FC are the four teams that would be fighting the promotion battle into the next years I League as four teams qualified for the Final Round of the I League Second Divison. The Final Round would kick off in Bengaluru on May 24 at FSV Arena between Ozone FC and Real Kashmir FC. After two months of grueling group stage battles and Final Four are set for another hotly contested final round to make it to the I-League. Real Kashmir FC qualified from Group A with 22 points from 10 matches staying unbeaten during the Group stage as Delhi based side Hindustan FC also qualified from Group A with 20 points from 10 games also maintaining their unbeaten run. Bengaluru based Ozone FC qualified from Group B in a fiercely fought group battle where Kerala FC was in with a chance to qualify only losing out to Fateh Hyderabad on the final day. Ozone FC managed to edge out Kerala FC on account of a better head to head records, both teams being tied to 19 points from 10 games. Robert De Souza and Sabeeth Sathyan were the stars for Ozone FC scoring 15 crucial goals between them to power Ozone FC to the final round. North Eastern side TRAU FC from Manipur were dominant throughout the qualifying phase in Group C amassing 23 points from 10 games having a stellar performance. TRAU FC topped Group C despite having three ISL reserve sides in their group along with Meghalaya side Langsning FC and Mohammedan SC. TRAU FC will be looking to replicate the achievements of fellow Manipur side NEROCA FC by qualifying in the I League next year as they rely heavily on the ludicrous amount of local talent available in the region. The final round would be a neck to neck battle between the four deserving sides. Ozone FC has been the most compact side defensively during the qualifying stage having conceded just 3 goals in 10 games. They have maintained 7 clean sheets and conceding just 3 goals is an incredible feat in itself in a group which had attacking sides like Kerala Blasters(Reserves) and FC Goa(Reserves). Technically it will be hard to break Ozone FC while they can be dangerous while attacking with Robert De Souza, tournaments highest scorer with 8 goals leading the line. TRAU FC would be another dangerous side the other teams will have to contain with. They will look to storm the game with pace and energy, signature to the Manipur style of play. TRAU FC would be relying on the team game and their industrious work ethics could be the deciding factor as they would chasing every ball while defending and attacking as a unit. TRAU FC can be dangerous attacking on the break with Nganbang Naocha, Peter Seiminthang and S.Rabindra can take down opposition backline with pace and intensity throughout ninety-minutes. Hindustan FC and Real Kashmir FC can be tricky sides on their day. They would be physical in their play and would be threat aerially with strong physical players but they need to match the fast attacking tempo of TRAU FC and compact possession game of Ozone FC as a tough round of battle awaits to decide the promoted team in next years Hero I-League.